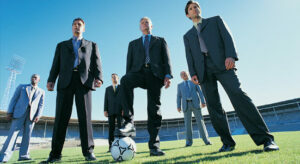 WHAT BUSINESS CAN LEARN FROM FOOTBALL FRENZY. The World Cup in Brazil has taken football frenzy to a new high. So what better time to consider what business people can learn from this exciting game? Those 90 minutes could be worth a lifetime of learning. 1. Have a goal – and defend it with your life. Don’t let anyone stop you from achieving the goal you have set yourself. It is in the opponent’s interest to deflect you from your goal. Use everything in your power to protect your goal and stay focused on it. 2. Never stop believing you can win. Not for a second should you doubt your ability to win. Confidence is infectious. Optimism leads to achievement. 3. Set high performance standards. Train rigorously and work hard to improve your performance levels. Give yourself stretch objectives. Don’t be satisfied with anything less than the very best. 5. Build an audience of real fans. Surround yourself with positive people who believe in you and support you. This positive energy helps you move forward. It’s good for your morale. You don’t want to let those fans down. 6. Have a clearcut strategy backed by a plan. It’s perfectly acceptable to research what’s working for your opponents. But that does not mean that you should copy what they’re doing wholesale. It may not work for your business. Formulate your own strategy after you have made a thorough study of the players in the market. Then make a plan and relentlessly follow it. 7. Focus on your defence. Many companies fail to anticipate formidable opponents. It’s good to have a forward-looking vision but also a defensive strategy. Predict challenges and be prepared to meet them. If you allow yourself to be taken by surprise, you could lose an important advantage. 11. Make sure you have good management. Your management should recognise talent and exploit potential.. Put your best resources into creating a winning team. 12. Play by the rules. As in football, business has its rules. Don’t indulge in underhand practices. Play fair. Win with the strengths you have and not by undermining the competition. As you watch the games, take a note of the intensity of focus that players bring to the field. That’s what you need to bring to your game in the world of business. Nothing else matters but winning. That’s the spirit that champions are made of.